These study guides, part of a set from noted Bible scholar John MacArthur, take readers on a journey through biblical texts to discover what lies beneath the surface, focusing on meaning and context, and then reflecting on the explored passage or concept. With probing questions that guide the reader toward application, The MacArthur Bible Studies are invaluable tools for Bible students of all ages. The theme of Paul's letter to the Colossians is the complete adequacy of Christ in contrast to the emptiness of mere human philosophy, a timely message in the face of the do-it-yourself, anything-goes New Age movement. MacArthur expounds on Paul's themes as he moves passage-by-passage through the text of Colossians and Philemon. His careful exegesis and life-changing applications expressed in a clear style and easily understandable language will appeal to both pastors and laypeople. 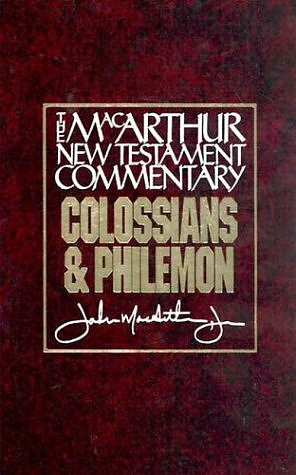 Colossians and Philemon : Macarthur New Testament Commentary by John MacArthur was published by Moody in July 1995 and is our 52262nd best seller. The ISBN for Colossians and Philemon : Macarthur New Testament Commentary is 9780802407610. Be the first to review Colossians and Philemon : Macarthur New Testament Commentary! Got a question? No problem! Just click here to ask us about Colossians and Philemon : Macarthur New Testament Commentary.